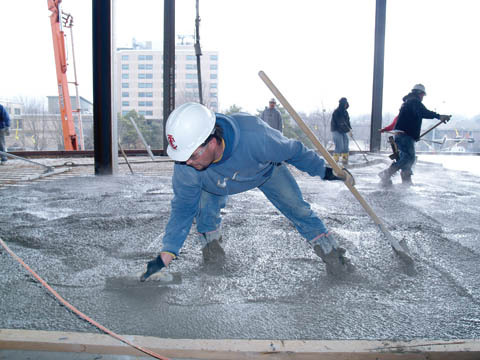 LEVEL WORK - Innovative Concrete employees level and smooth concrete on the second floor deck of the International Quilt Study Center on March 16. The construction site is the first "green" build for the University of Nebraska and Hawkins Construction. Photo by Troy Fedderson/University Communications. When Dave Seda's crews lay the final brick, the International Quilt Study Center will be in the green - environmentally speaking. UNL's inaugural Teaching and Learning Exposition is March 29 at the Van Brunt Visitors Center and Mary Riepma Ross Media Arts Center. In addition to a keynote speaker, the seven latest recipients of Initiative for Teaching and Learning Excellence grants will be recognized and posters depicting the success of previous ITLE projects will be available for review. This is the first of a two-part series on UNL's Indigenous Roots Teacher Education Program. This story centers on students currently enrolled in the program. The March 29 story will feature program graduates who are teaching in Nebraska's Native American schools. After missing out a year ago, Linda Blunt could hardly wait to putter around at work. The International Quilt Study Center and Mountain Mist/Leggett and Platt have announced a quilt competition with an eco-friendly theme. The Robert Hillestad Textiles Gallery presents the exhibit "Bonnie Cashin Plus Six" through April 13. The exhibition includes 33 garments by American designers who developed a reputation for their independence and vision in the post-World War II era. The first of two exhibitions featuring Master of Fine Arts candidates from the Department of Art and Art History opens March 26 at the EisentragerHoward Gallery in Richards Hall. Combining all-time favorite Elvis Presley songs with a rock and roll story, the Broadway musical "All Shook Up" rides into the Lied Center for Performing Arts for 7:30 p.m. performances on March 28-29. "The Blizzard Voices," a collection of poetry by Ted Kooser recording the devastation unleashed on the Great Plains by the blizzard of Jan. 12, 1888, is included in the 2007 Book Sense Poetry Top 10. The annual Midwest ClariFest is March 30 at the UNL School of Music. Events will take place in Westbrook Music Building and Kimball Recital Hall. Michael James, professor of Textiles, Clothing and Design, will offer the lecture "Michael James: Comments on Art Quilt Makers in Europe" 5:30 to 7 p.m. March 22 at the Haydon Art Center, 335 N. Eighth St., Lincoln. The Department of Art and Art History hosts the final two Hixson-Lied Visiting Artists of the 2006-2007 academic year, Kim Abeles and Lee Boroson. One of the ways a poet makes art from his or her experience is through the use of unique, specific and particular detail. This poem by Rick Snyder thrives on such details. It's not just baseball caps, it's Tasmanian Devil caps; it's not just music on the intercom, it's James Taylor. And Snyder's poem also caught my interest with the humor of its flat, sardonic tone.